Russian Foreign Minister Sergei Lavrov spoke to journalists after finding no common ground on Ukraine during talks with U.S. Secretary of State John Kerry in London. Sergei Lavrov and John Kerry and their aides sat down at the U.S. ambassador's residence in London for a scheduled 90-minute talk. The discussion lasted five hours. Several times they took a break for a one-on-one meeting, walking on the lawn outside the residence. But they did not manage to find a mutually acceptable solution for the Ukrainian crisis. Summing up the talks, Lavrov told journalists: "The discussion was undoubtedly useful. But we do not have a common vision of the situation, differences remain." He went on to say that Moscow saw no need to set up a contact group on Ukraine as suggested by Washington since that group was supposed to assist a direct dialogue between Russia and Ukraine. "We think there is a contradiction in terms here since the crisis arose not through Russia's fault," Lavrov said, "Russian-Ukrainian relations have not been interrupted." A source at the Russian Foreign Ministry told Kommersant that Russia put forward an alternative proposal, to set up "a mechanism of international assistance to the settlement of the Ukrainian crisis on the basis of the Feb. 21 agreement." Lavrov announced that Kerry had agreed with his reasoning in favor of a constitutional reform that "would take into account the interests of all Ukrainian regions." A source at the U.S State Department, however, explained "these measures could not be set in motion until Russia changes its course on Crimea, i.e. withdraws additional forces from there and stops supporting its separatism." On the subject of Crimea, Lavrov replied to a question about tomorrow's referendum by saying that he hopedRussia’s Western partners "would realize this is a case that cannot be considered in isolation from history." Said Lavrov: "If our partners say that Kosovo is a special case, we respond by saying that then Crimea is an even more special case. Whether there are precedents in international law or not - incidentally, there are - everyone understands what Crimea means to Russia." In case there may have been someone listening who did not understand, Lavrov went on to say: "For Russia, Crimea means immeasurably more than the Falklands mean for Britain or the Comoros for France." The Russian minister made a special emphasis on the story of the Comoros Islands, which voted in a 1975 referendum on independence from France. "One of the islands voted against [independence]. For that reason, France insisted on a recount of votes to calculate votes cast by each island individually rather than by all voters of the Comoros together," Lavrov said. "It was on these grounds that the island of Mayotte remained within France as a colonial territory and was later made part of the French Republic. What was it, annexation or self-determination, I don't know. The UN and the African Union did not recognize that decision by France, but the EU is quite happily living with it," Lavrov said. He went on to stress that the right of nations to self-determination is set in the UN Charter. "As for statements from our Western partners saying that this step (the referendum) is unacceptable, we proceed from the premise that the right of nations to self-determination has not been cancelled by anyone. There are numerous instances when a nation exercised this right," Lavrov said. At the same time, Lavrov failed to give a clear answer as to what will happen to Crimea after it has exercised its right to "self-determination." Asked whether Crimea will become part of Russia or not, Lavrov was non-committal: "As for the referendum, we have already – in the words of the Russian president – said that we shall respect the choice of the people of Crimea and we shall express our position after the results are known." Lavrov also, yet again, accused the West of interfering in Ukraine's domestic affairs, saying that it was responsible for the current situation. "Inaction and encouragement for a long time of the movement in which the Ukrainian leaders were heading in the end prompted the Supreme Council of Crimea to decide to hold a referendum," he said. For his part, John Kerry told journalists that the United States and the international community would not recognize the results of the Crimean referendum. 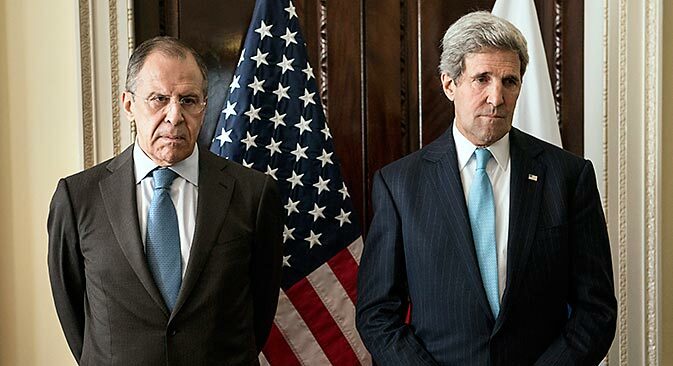 At the same time, Lavrov said that Kerry had not put forward "any threats" against Moscow. Lavrov pointed out that "Western sanctions against Russia are a counterproductive instrument." He said: "If such a decision is made, it would not be in our mutual interests of developing our partnership."